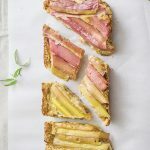 Rhubarb Tart, a beautiful, ombre tart that is slightly sweet, slightly tart but oh so decadent! 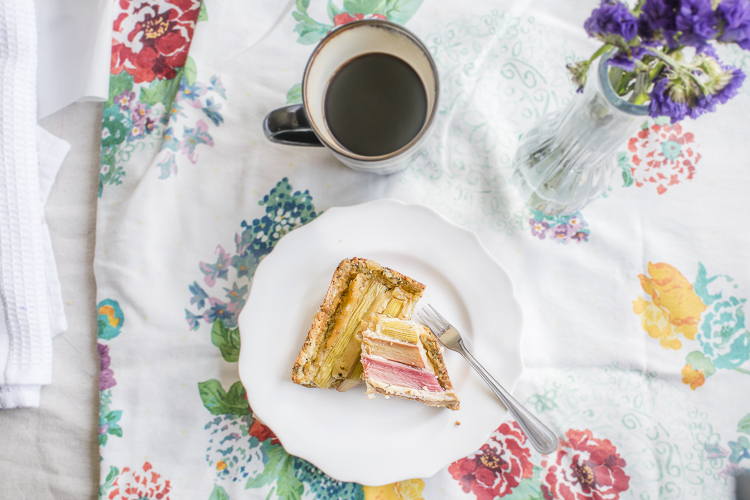 Hmmmm, is there anything better than a little afternoon treat with a warm coffee? I think not! This tends to be one of my favorite times of the day. I always take a break in the afternoon to just reflect on the day, get organized and reset. 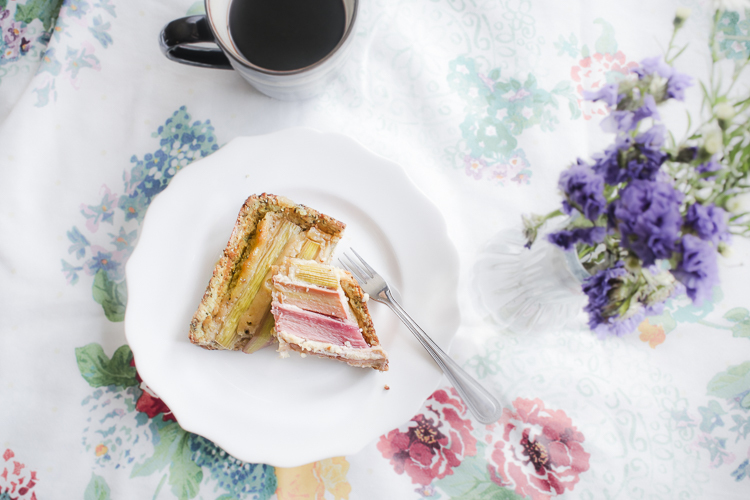 This rhubarb tart recipe has been my little sweet treat on more than one occasion! You could really call this an almond tart or macadamia tart because those are two prominent ingredients! The rhubarb is similar to a granny smith apple, tart and slightly sweet. The filling is sweetened with honey and a touch of vanilla really sets it off. 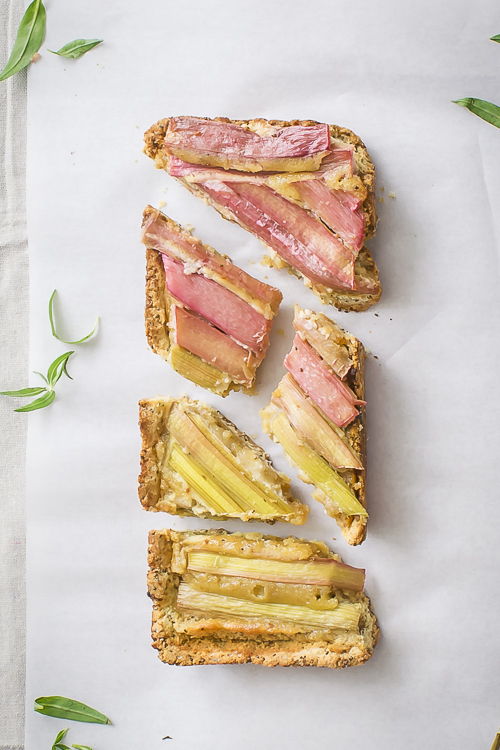 I’d like to say this rhubarb tart recipe is kind of like a chewy cookie bar! The filling is slightly custardy, rich, and decadent from those macadamia nuts, yum!! 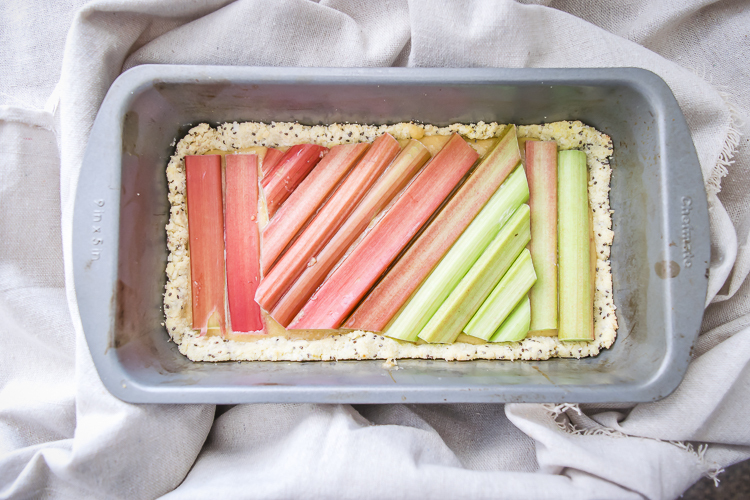 I really like to arrange my rhubarb slices so it looks like a beautiful ombre rainbow! Talk about a show-stopper! I truly hope you make this tart! It is so delicious and I know you will impress lots of friends with this one! For even more yummy recipes please visit my blog, This Silly Girl’s Kitchen! See you there! Before making the tart, you need to pre-bake your crust in a 9-inch tart pan. I suggest using this one from The Healthy Tart! Pre-heat the oven to 350 F. Spread nuts on a baking sheet. Toast them until fragrant and slightly golden, about 5 minutes. Let it cool. Grind the nuts in the bowl of the food processor. Add almond flour and salt. Process to combine. In a measuring cup with a spout, mix the melted coconut oil, honey, egg and vanilla to combine. With the processor running, pour the egg mixture in, processing until just combined. Pour over par-baked crust. Arrange rhubarb on top. Bake for 40 minutes or so in pre-heated oven. You are probably going to have to cover the pan with foil if the top is browning too fast. Wait until it cools, slice and serve. I like to arrange the rhubarb in a pretty ombre tone. Cut the rhubarb stem in half lengthwise and you are going to obtain two flat sides that will lay beautifully over the macadamia filling. This recipe is gluten free and refined sugar free. To maintain that, use a similar crust recipe like the one suggested.